Hubert Mingarelli’s simple, powerful, and moving stories of men in combat have established him as one of the most exciting new voices in international fiction. 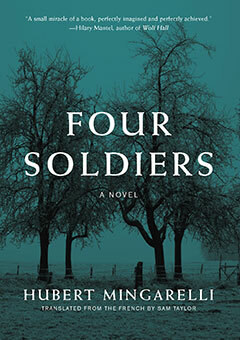 In Four Soldiers he tells the story of four young soldiers in 1919, members of the Red Army during the Russian civil war. It is set in the harsh dead of winter, just as the soldiers set up camp in a forest in Galicia near the Romanian front line. Due to a lull in fighting, their days are taken up with the mundane tasks of trying to scratch together what food and comforts they can find, all the time while talking, smoking, and waiting. Waiting specifically for spring to come. Waiting for their battalion to move on. Waiting for the inevitable resumption of violence. Recalling great works like Isaac Babel’s Red Cavalry, Ernest Hemingway’s A Farewell to Arms, and Stephen Crane’s The Red Badge of Courage, Four Soldiers is a timeless and tender story of young male friendships and the small, idyllic moments of happiness that can illuminate the darkness of war. The New Press is pleased to share a Reading Group Guide for A Meal in Winter by Hubert Mingarelli.